“I’m changing the lineup in my band,” Frehley tells the Cassius Morris Show. “I’m actually gonna start working with the band that back up Gene. I worked with them in Australia, and they also did eight shows with me in Japan. And I realized that … I think they were better than my current lineup, so I’ve decided to make a change. They're younger and more hungry." The rocker had been touring for years with a lineup of longtime guitarist Richie Scarlet, drummer Scot Coogan and recent addition Chris Wyse on bass. 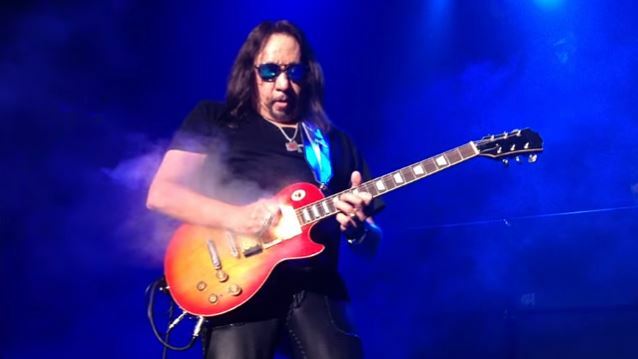 Frehley’s opening slot on Simmons’ recent Australian tour saw him joined by guitarist/vocalists Ryan Cook and Jeremy Asbrock, bassist Philip Shouse and drummer Christopher Williams; the group also went on to perform shows in Japan with the former KISS guitarist. Asbrock and Shouse are the founders of the populat Nashville, TN tribute band Thee Rock ‘N’ Roll Residency, who regularly feature guest appearances by touring rockers. Due October 19, “Spaceman” sees Frehley deliver eight new original tracks alongside a cover of “I Wanna Go Back” by the Oakland, CA group Billy Satellite that went on to become a US Top 10 hit for Eddie Money. The project also features a guest appearance by Simmons on “Without You I’m Nothing” and "Your Wish Is My Command" - two songs Frehley co-wrote with his former KISS bandmate last year. Frehley is among the artists scheduled to perform on KISS Kruise 8 later this month, which sets sail from Miami, FL to Key West and Nassau, Bahamas with a lineup that includes Vintage Trouble, The Dead Daisies, and more.